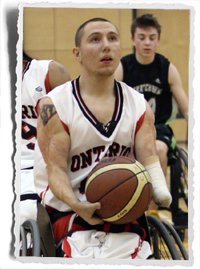 Wheelchair basketball player Shayne Smith is a finalist for the 2011 Ontario Sport Award for Male Athlete with a Disability of the Year. Ontario is recognizing 33 of the province’s top amateur athletes and coaches whose performances excelled on both national and international arenas, including at the 2011 Pan/Parapan American Games. The 2011 Ontario Sport Awards celebrate the outstanding contributions of athletes, coaches, officials, volunteers and corporate sponsors who support amateur sport in Ontario. Winners will be announced and recognized on April 19, 2012 in Toronto. The Ontario Sports Awards are a provincial award program established in 1965 to honour and promote athletic achievement and participation in sport and fitness. The awards annually recognize athletes and coaches who have distinguished themselves nationally or internationally in the previous year, as well as corporate sponsors and volunteers who have contributed to the development of amateur sports in Ontario. It is the highest recognition for sport excellence in the province.